It's all the good things that others have said but I love the way you change the batteries. No trying to pry or snap the case open and risk breaking something, like I did on my Aurora headlamp. There's a small screw that holds the front and back cases halves together. Unscrew it, using the small plastic piece that's part of the head band, and the back half of the case folds down on real hinges. And you don't have to worry about loosing the screw as it's captured in the rear case half, and can't fall out. All in all I believe this is the best headlamp I've ever had. I bought mine for use while backpacking but wind up using it around the house all the time too. I have been very happy with this headlamp. It is bright enough for night hiking and the angle can be adjusted depending on what you need to see (or to keep from blinding your hiking partner when you turn toward them). The low-battery warning is a nice feature. 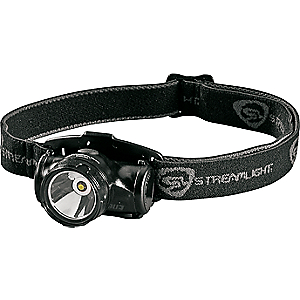 I also like that this light is water resistant; this is important for a hiking headlamp because sometimes one ends up hiking in rain and it may happen to be dark out as well. My only complaint is that it is kind of hard to open the battery compartment. Maybe this part of the design is necessary for water resistance, but it does make battery changes a bit of a pain. The good news is that this light doesn't go through batteries very quickly. This is my 1st headlamp, and I am not disappointed. This is my 1st headlamp, and I am not disappointed. I nearly always keep it on low around camp, and have not used brighter settings unless I was hiking at night. The batteries do seem to last quite a long time. Comfortable fit, and easy as hell to switch on / off. For overall usable light, the Quad does everything I want it to. Like all Princeton Tec lights, you can drop it, throw it, and just beat the crap out of it and it just refuses to break. It is very consistent in the light power and gives you a nice warning when the battery is low (this is rare because they last forever) and still gives you enough light for the rest of your trek before it goes dim. It covers the width of the trail and goes out about 25 feet in front so you are covered. It has regulated current for 33 clams! It is also brighter then the Tikka Plus or BD Cosmo. Waterproof! Lifetime gurantee! I never go outside without it. I love how beefy the housing is, very reasuring when I have seen many cracked Tikkas. This is the light I use 90% of the time. I use it for backpacking, car camping, walking the dog and doing home repairs. It is dependable, easy to use and puts out plenty of light. I upgraded from a PT Aurora headlamp -- this one is much brighter! Short battery life on the highest light setting. Plenty of light for me on the other settings. I replace the batteries twice a year. I replace them when the light output appears the same in all three of the brightness settings. One nice feature that does not appear be advertised is that the LEDs glow in the dark when the lamp is off. Makes it easy to find in a dark tent. This headlamp is not suited for hiking in unfamiliar terrain at night. Perfect for working around the camp site and walking familiar routes. 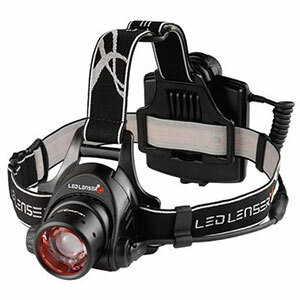 This headlamp works great, is comfortable, and most importantly in my opinion, let's you know when the batteries need to be changed without dimming. Being an LED, it is not as bright as halogens, but for around camp or the house it will certainly be adequate. I have hiked trails at dusk using this, but I knew them well and they weren't too technical. 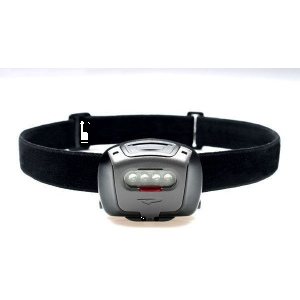 It wouldn't be powerful enough for hiking at night on unknown or technical trails in my opinion. I would give this lamp 5 stars but the dim mode stopped working so I was stuck with bright and flash. I talked to Princeton Tec and they replaced it. I have a buzillion headlamps and use them all for one thing or another (except that new one I got that we won't mention here). My super duper one is the Princeton Tec Apex. It has a beam plus flood settings. It's also overkill for many of my headlamp needs so when I want something light (in weight) easy (to use functions) and bright I seem to be grabbing my quad the most. The buttons are easy to press and the actuation sure and snappy. There are 3 brightness settings plus a flash setting. No battery pack. Makes it light and easy to wear. The amazing thing is how bright the thing is, esp when you consider it has not battery pack, just 3 AAA batteries. Another cool thing is how easy it is to change the batteries. Some of mine, like my Petzl tikka plus, you have to mash an indentation to open it, then hold the batteries in while you try to like the housing up to close. Not a big deal really but the quad has a nice little screw. It really feels like a quality light that costs much more. 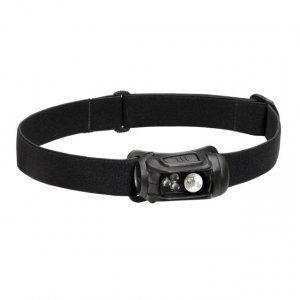 This headlamp does not have a penetrating beam led like some but the beam is bright enough for tasks like hiking, trailing game, or even working in the yard at night. My Apex is brighter but the Quad is lighter and more comfortable to wear, and almost as bright as the apex flood beams, that I just seem to grab it the most. All in all a good value for the money. 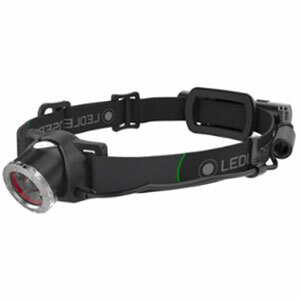 The Quad is an effective, portable, adjustable and comfortable 4-LED headlight when it's not cracked and broken. Maybe I've been unlucky, but both Princeton Tec headlights (a Quad and a Fuel) have suffered unassisted plastic housing fatigue. The Fuel's plastic battery lid hinges simply gave way shortly after purchase. Now the Quad has developed a half-inch crack through the top of the plastic housing and plastic lens. I must stress this damage was not caused by any misadventure. It is purely fatigue! Princeton Tec was good enough to replace the Fuel. I shan't bother asking them to do likewise for the Quad. Why suffer another disappointment? Princeton Tec - never again.